The necessity for process cooling in plastic processing is due to the need to cool or chill plastics processing machinery and is mainly related to thermoplastic materials. Dependant on the process speed and the quantity of plastic material being moulded or extruded, process cooling can be applied in many ways. 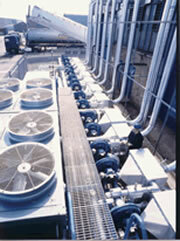 The larger plastics processing plants generally have a centralized process water cooling or chilling system. Pipes circulate the cooling water through the plastics machinery and subsequently the warmer return water back to the central cooling unit. These centralized chilling and cooling systems can either be refrigerant process water chillers or the forced air type, more commonly known as air blast coolers, depending upon the temperature of water required. Alternatively, independent refrigerant type water chillers can be sited next to a plastics processing machine to provide individual machine cooling. Generally the larger installations rely on the refrigerant based centralised chilled water systems. A combination of water chillers and air blast coolers can be installed to achieve low energy “free cooling” during low ambient conditions. By the laws of physics, heat energy will only travel from a hotter medium to a colder medium. Cold energy cannot travel in the reverse direction, i.e. from a cold medium to a hot medium. All process cooling systems are based on these principals of heat transfer. The refrigerant gas in vapour form is compressed then cooled via the condenser to return it to a liquid state. It is then injected into one circuit of an evaporating vessel via a thermostatic expansion valve. Warm water from the process is circulating in the other circuit of the evaporator and the heat from the water transfers from one circuit to the other to evaporate the liquid refrigerant. The thermostatic expansion valve controls the flow of refrigerant into the evaporator according to the prevailing process heat load. Now as a vapour, the refrigerant gas returns to the compressor and the cycle continues. In this way water temperatures well below existing ambient air temperatures can be achieved, typically 5ºC to 15ºC. These function very much like a car radiator. The warm process water is pumped through a coil matrix. Air at ambient temperature is forced over the fins of the coil effecting a transfer of heat into the air. The now cooled water is pumped back through the water cooling system to the plastics process machinery. This method of process cooling is entirely dependant on the ambient air temperature for its cooling efficiency and the water temperature achieved would normally be within 3º to 5ºC of the prevailing air temperature. Lower water temperatures can be achieved by using an “adiabatic air blast cooler” which in principle is the same but with the addition of a water spray system which at high ambient temperatures coats the fins with a water mist. Most plastics processing machines use hydraulic systems to control the machines moving parts. The hydraulic pump motor becomes hot when operating under load and heat from the motor will transfer to the oil via the motor shaft and pump casing. Further heating of the oil will result from the friction caused by the flow of the hydraulic oil through the valves, pipes and cylinders. All hydraulic oils have advisory maximum operating temperatures, so hydraulic oil cooling is one of the functions of plastics process cooling systems to ensure that the hydraulic oil is maintained at its optimum working temperature. 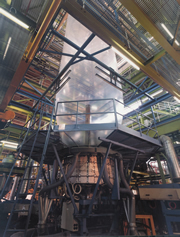 The extrusion process has a water bath or spray system in which the hot plastic being extruded is immediately immersed. The bath or spray is connected to a chilled water system which creates the necessary heat transfer to solidify the plastic. In the plastic blown film process, the air blown into the bubble can be chilled by passing it across a finned heat exchanger, which is supplied with chilled water. The air cooling or chilling system can have the effect of improving the clarity and quality of the film and speed at which it can be produced. Despite the best effects of process cooling, plastic processing factories invariably become hot. To assist in reducing the ambient temperature and the comfort of employees, Evaporative Cooling Systems can be installed. Air temperatures can be reduced by up to 10deg c.
The cost of installation of such systems can be 75% less than conventional installed air conditioning systems, and 90% less to operate. 6.1 How process cooling works? A stream of hot air is moved across a wetted surface. Water is evaporated as it absorbs heat from the air causing a reduction in air temperature.